The Lumix AG-YAGHHG Interface Unit for GH4 from Panasonic is designed to give the Lumix DMC-GH4 camera the video, audio, and power connectivity required for professional video workflows. When attached to the GH4, the Interface Unit has two monaural XLR inputs for line or condenser microphones, and gives you independent volume control of the left and right channels. There is also an audio level display monitor and +48V of phantom power for each channel. On the front of the unit you'll find a pair of front facing screw holes, which provide expandability for rod systems and added stability for PL mounts. When it comes to video outputs, the Interface Unit provides four BNC connectors - two 3G-SDI capable and two HD-SDI capable. It outputs quad-link SDI 4K video in 4:2:2 10-bit, dual-link 4:2:2 10-bit 1080p up to 60 fps, or four simultaneous 1080p streams up to 30 fps - all with timecode. The Interface Unit also has a BNC connector for timecode input, and converts the GH4's micro HDMI output to a full-sized HDMI output. For power, a 4-pin XLR 12VDC input is available. Note: The Interface Unit is not powered by the GH4 and requires an external 4-pin XLR 12VDC power source for use. Note: When using 4:2:2/10-bit output, simultaneous video recording to an SDHC/SDXC memory card in the DMC-GH4 is not possible. 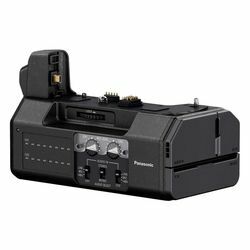 The Lumix AG-YAGHHG Interface Unit for GH4 from Panasonic is designed to give the Lumix DMC-GH4 camera the video, audio, and power connectivity required for professional video workflows. When attached to the GH4, the Interface Unit has two monaural XLR inputs for line or condenser microphones, and gives you independent volume control of the left and right channels. There is also an audio level display monitor and +48V of phantom power for each channel. On the front of the unit you'll find a pair of front facing screw holes, which provide expandability for rod systems and added stability for PL mounts. When it comes to video outputs, the Interface Unit provides four BNC connectors - two 3G-SDI capable and two HD-SDI capable. It outputs quad-link SDI 4K video in 4:2:2 10-bit, dual-link 4:2:2 10-bit 1080p up to 60 fps, or four simultaneous 1080p streams up to 30 fps - all with timecode. The Interface Unit also has a BNC connector for timecode input, and converts the GH4's micro HDMI output to a full-sized HDMI output. For power, a 4-pin XLR 12VDC input is available. Note: The Interface Unit is not powered by the GH4 and requires an external 4-pin XLR 12VDC power source for use. Note: When using 4:2:2/10-bit output, simultaneous video recording to an SDHC/SDXC memory card in the DMC-GH4 is not possible.